The Summit Series Front Bumper Replacement still provides superior protection similar to the Legend while offering an alternative style with reduced weight. 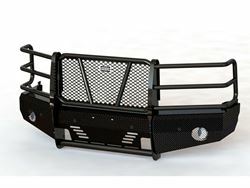 This bumper is designed and ideal for half ton trucks. It is frame-mounted and is one-piece fully welded construction. The main body of the bumper is manufactured from diamond plate steel and the grille guard portion provides wraparound headlight protection. 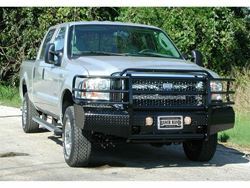 The punched plate grille insert is specifically designed to match the make and model of the vehicle – no expanded metal used. Most pre-2014 Summit Series Replacement Bumpers allow for the optional patented H2R (Hidden 2" Receiver). In some applications, factory fog lights and tow hooks can be retained.